If your goal is to MAXIMIZE your fund-raising potential, put our Wild Wings Conservation and Fund-Raising Department to work for you! Wild Wings works with over 2,500 fund-raising event committees per year, and we know the challenges you face. Wild Wings offers framed art and home décor that are both decorative and functional (with over 4,000 items at prices from $7.20 to over $2,500). We make it easy to promote your auctions and raffles with gifts the entire household will appreciate and remember. 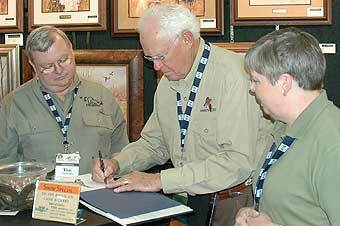 Wild Wings artist Jim Killen (center) was on hand to meet attendees of the 2010 DU Sporting Expo in Grapevine, Texas. Tim & Ann Hofius from Mercer County Ducks Unlimited Chapter in Pennsylvania are shown here with artist Jim Killen as he autographs a book for them. If we’re in a position to offer advice, it’s because of customers like you, from whom we’ve learned everything! For 40 years, Wild Wings has proudly served as “Your Partner in Conservation”.